Students can report their grievance to the Class Co-ordinator (CC) or Class Representative (CR). If the grievance is not redressed at the Stage I the student can refer the matter to the General Secretary (GS) of the College. The grievance which could not be sorted out at Stage II can be further referred to the concerned Class Teacher. Further the grievance which could not be resolved at Stage III can be resolved by the respective Programme Co-ordinator. The grievance which could not be redressed at Stage IV can be addressed to Grievance Cell Committee of the College. The Vice Principal undertakes the grievance which could not be sorted at Stage V.
If the grievance couldn’t be solved at Stage VI the final decision regarding the grievance is vested in the hands of the Principal of the College. 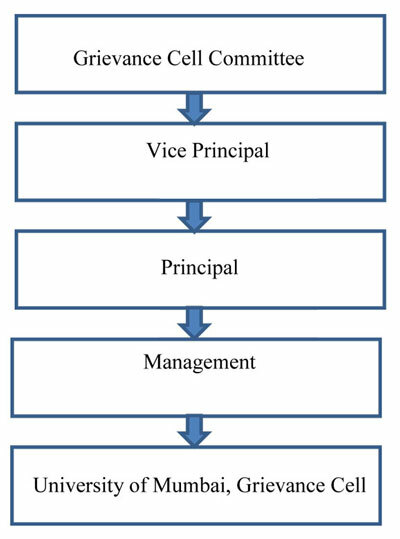 The matter which could not be resolved at Stage VII would be referred to Top Management for further procedure. If the grievance couldn’t be redressed at Stage VIII it can be resolved at University of Mumbai, Grievance Cell. The above is the Step Ladder Method of Grievance redressal mechanism of the College apart from it Open door policy is also in place where students can directly approach top management. The grievance can be addressed to Grievance Cell Committee of the College. Vice Principal undertakes the matter which could not be redressed at Stage I. The grievance which couldn’t be addressed at Stage II the final decision regarding the grievance is vested in the hands of the Principal of the College. The grievance which could not be resolved at Stage III would be referred to Top Management for further procedure. The grievance which could not be sorted at Stage IV both Teaching and Non- Teaching Staff grievances can be resolved at University of Mumbai, Grievance Cell. The above is the Step Ladder Method of Grievance redressal mechanism of the College apart from it Open door policy is also in place where both Teaching and Non- Teaching Staff can directly approach top management.